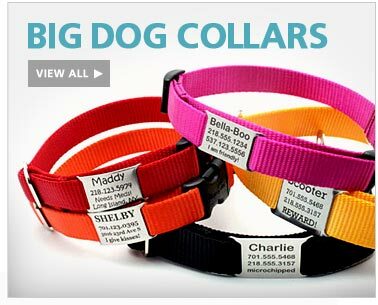 Personalized dog collar with a laser engraved metal buckle that is lightweight and strong. The design features superior quality woven jacquard ribbon securely stitched to heavy duty and durable USA made nylon webbing. Personalized dog collar with a laser engraved metal buckle that is lightweight and strong. This heavy duty webbing that is woven, not stamped or screen printed, therefore the pattern is on both sides. Aromatherapy Calming Dog Collar help with anxiety, caused by fear of storms, fireworks or stressful trips to the vet office. The blend of herbs help the wearer overcome stress and anxiety and just be a bit more relaxed. The Game Over Dog Harness is made of durable nylon with a printed canvas overlay. Easy-grab handle on the back helps you control your dog. Water resistant. Matching leash with padded handle is available for a coordinated look. Premium leather dog collar. Soft, comfortable and durable. This handcrafted design,features top and bottom leather layers reinforced with ballistic nylon.